In the glory years, Detroit was a diverse, hard-working city, powered by innovation andcreativity. Birthplace of the assembly line. Arsenal of democracy. Dynamo of prosperity, bouncing forward to a pulsing Motown beat. Then, for reasons too complex to sum up in a few words, Detroit stumbled. For a long time, the city struggled to regain its footing, seeming to be always on the verge of falling to its knees. But now Detroit is regaining its stride. It has a new energy, a sense of purpose, and a culture of entrepreneurship that is making things happen. Northwood knows a thing or two about entrepreneurship, so it’s not surprising that the university is playing a part in Detroit’s renewal. In one example, a Northwood graduate is investing in the city through a fascinating urban forestry initiative (see story, Page 6). For something a little more hands-on, check out the Northwood edition wristwatch from Shinola Detroit, a new company that is making Motown’s urban cool a worldwide phenomenon. Shinola launched in 2012 with nine assembly workers and a stylish retail store in a blighted part of Detroit. The stated goal was to generate employment in a city that desperately needed it by producing fashionable watches with an appealing brand. The company also makes high-end bicycles, and sells an eclectic variety of products – among them leather goods, jewelry, and audiophile turntables – that can really only be linked by one word: hip. It has expanded to more than 25 retail locations (several new ones are opening this summer) around the country and also has locations across Europe. Shinola marketing whiz Peter Shin spoke at Northwood in 2016 as part of Values Emphasis Week, and the natural fit between the company and the university was obvious. In true entrepreneurial fashion, something got going very quickly. Shinola agreed to produce up to 500 watches and provide them to Northwood at a wholesale price. Northwood would sell them at the retail price of a comparable Shinola watch. And rest assured, this is not your typical timepiece. The watch face is Northwood blue. “Northwood University” is etched on the stainless steel body. It comes in a display-quality wooden box with the school’s logo burned into the top. Its Super-LumiNova hands are driven by an Argonite 1069 high-accuracy quartz movement. 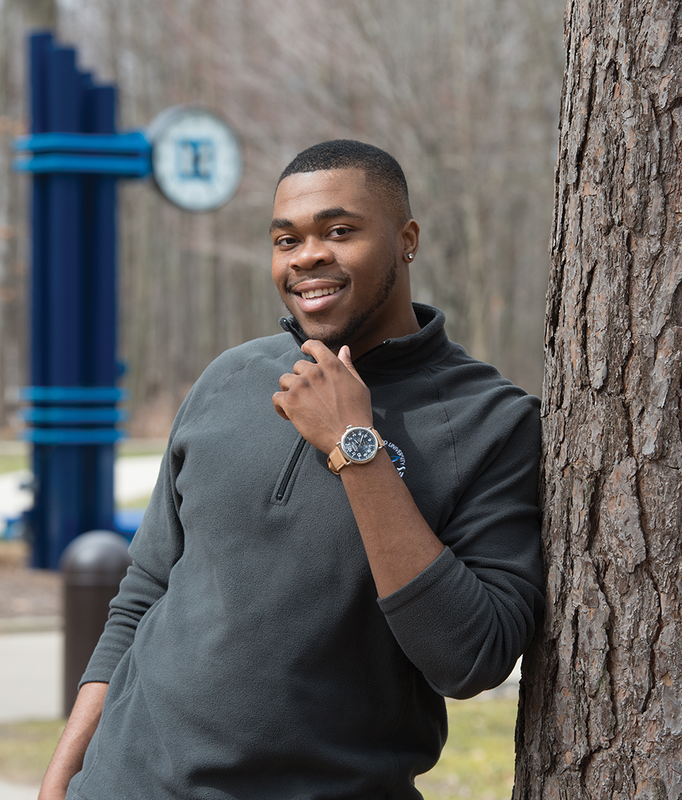 “It’s a beautiful timepiece, and it’s unique to Northwood University,” Marshall said. “They are a point of pride for the alumni network – something that can be worn proudly, giving each wearer the opportunity to help others and to tell a great story." The only place to order the special edition watch is at Northwood’s website, www.northwood.edu/events/shinola. It comes in three case sizes, 47 mm, 41 mm, or 36 mm, and sells for $550. A Northwood degree comes with an added bonus that many alumni may not know about: a scholarship designed especially for their eligible NU legacy-student children. The Alumni Legacy Endowed Scholarship was created in 2010 to recognize academic achievement and leadership potential in the children of our alumni who choose Northwood University. Northwood is fortunate to have alumni who have passed on their enthusiasm for their alma mater and “The Northwood Idea” to their children. We celebrate this special relationship by offering financial support to kids whose love of Northwood was ignited by their parents. Craig Smith, ’81, is an entrepreneur and dealer operator of Craig Smith Auto Group and Craig Smith RV Center in Ohio. The years he spent at Northwood prepared him for his successful career and also shaped his belief in the importance of a free enterprise system. His son Brent started at Northwood a year into the ’08 economic downturn, which hit the auto industry especially hard. The Alumni Legacy scholarship that Brent received lightened the family’s financial burden during an incredibly challenging time. Now Craig and his wife, Ginger, are happy to give back to help other students attend Northwood. “Every day of my life I use something I learned in college, from accounting to writing. So I was very happy when Brent chose Northwood. Now that he’s graduated, I can say that he gained knowledge and skills, especially how to think critically and to do so with empathy, that will contribute to his future success. Northwood has made a big difference in both of our lives. And I’m equally excited that our younger son, Alex, is starting at NU this fall,” said Craig. Brent Smith, ’13, general manager of Craig Smith RV Center, had his heart set on Northwood from the time he was in middle school. His choice may have seemed like a “natural,” given that his dad is an alumnus. However, it was also an excellent choice for his career. Brent’s Northwood education helped him learn about the multifaceted automotive business. And the connections he made at school have helped him build his industry knowledge and support base as he builds his future. For more information or to donate to the Northwood Alumni Legacy Endowed Scholarship, please contact Sherri Riepma, Private Donor Scholarship coordinator, 989-837-4146 or riepmas@northwood.edu. For roughly four decades, The Northwood University Gallery has provided Midland with a place to experience the expressive works of talented artists. The Gallery is a retail operation specializing in decorative art, jewelry, home accessories, and gifts. It serves as an extension into the community of the Northwood Idea, especially the belief that an understanding and appreciation of the arts and humanities is a primary source of human enrichment in the lives of productive human beings. Meanwhile, downtown Midland continues to grow and thrive, with new businesses, activities, and energy. A key part of that momentum is the renovation of the H Residence hotel, which played a role in the location of Northwood Gallery. The Gallery has actually had several homes through the years. Opened in 1978, the Gallery was part of the Town & Campus project, a women’s organization in Midland that connects the community to Northwood. In 2000, the Gallery relocated to its own space donated by the Midland Area Community Foundation, at the corner of Ashman and Main streets. In 2014, it moved yet again, making way for the H Residence renovation. In April of 2017, the Gallery returned to its Ashman and Main location, within the renovated H Residence. The new location features bright colors and geometric shapes that pay tribute to renowned Midland architect Alden B. Dow. Now on display at the Gallery is the exhibit “III Voices: The Art of Photography,” which features the work of local artists Preston Jones, Stephen K. Grewe, and Armin Mersmann. The exhibit is open to the public six days a week. Four years later, Lewis isn’t the only one making an impact at Bluewater in Southfield, Michigan. She has helped recruit and hire 10 more employees with Northwood ties, including a pair of current interns. “It’s kind of become a joke: ‘Oh, there’s another Northwood alum working here. Aren’t there other universities out there?’” laughed Lewis, who is director of the Project Management Office. Lewis has brought on four women who, like her, were members of the Alphi Chi Omega sorority. It’s the kind of work Lewis honed as events chair for the Northwood University International Auto Show and as vice president of communications and membership for Alpha Chi Omega. She has a 2008 bachelor’s degree from Northwood in marketing, advertising and management and a 2013 master’s degree from Walsh College in Troy, Michigan. “Whenever I see people interview here, they say the people here are so cool, it feels like family,” Lewis said. Having interviewed numerous hires over the years, Lewis said the Northwood students stand out in the best way. Northwood’s classrooms — where students interview in front of the class and accept critiques, ask insightful questions and review realworld scenarios with professors — help prepare students for job interviews. “The presentations and projects seem so stressful in the moment, but the experience and the feedback you gain carries you miles further than other candidates for the job,” Lewis said. Header photo caption: Northwood President and CEO Keith A. Pretty (center) presented Bluewater Technologies with the university's Entrepreneurial Spirit Award. Pictured from left to right are Nicole Gabridge, Victor George IV, Andrew Hanagan, Hannah Hayes, Melissa Phillips, Brittney Lewis, and Andrea Hlavaty. Two clubs, two trips to compete on the world’s stage, and more than 26 national awards. Northwood University’s Distributive Education Clubs of America (DECA) and Business Professionals of America (BPA) made their mark in national competition this past spring. All 13 of NU’s DECA team members placed at the California competition, with four finishing as Top 10 Finalists. At BPA nationals in Orlando, 13 Northwood students drew honors. 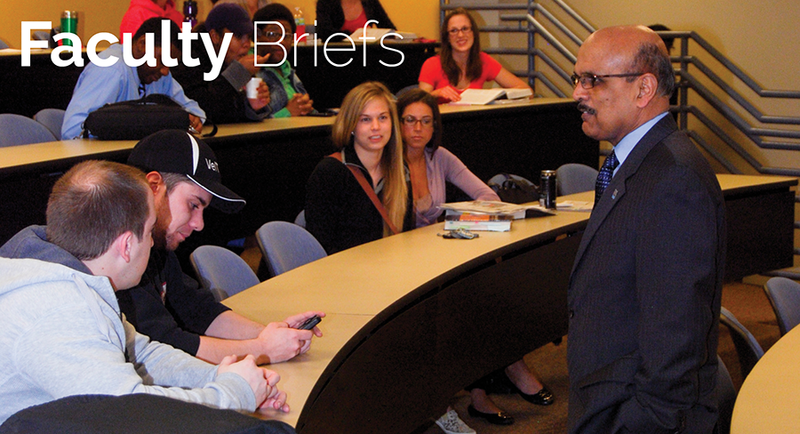 The clubs have rich history on campus with an active DECA club since 1984 and BPA since 1998. Combined, that’s five decades of facilitating student growth and giving participants an edge in the job market. One of the ways that Northwood students learn by doing, the experience of high-level competition has left a mark on the students who competed, as well. Joseph P. Walsh, 20, came to Northwood after his high-school DECA experience won him dedicated scholarships. “What you put in is what you get out of it. Nationals really showed me that,” he said. “Joseph’s leadership was, in large part, responsible for the success of the workshops and the great success of the high school students that attended them,” said John Gustincic, adviser to the club. Nineteen students from Northwood’s BPA chapter competed at nationals in Orlando, Fla., with 13 placing. Taylor says the presentation experience also helped him develop skills he will soon need for his career. Headline Photo Caption: Northwood's Mock Trial team chalked up another successful season, advancing to the American Mock Trial Association’s Regional Tournament in Ohio. One team qualified for the opening round of the championship series in Ohio. Leeza Bacon, Health Care Management department chair, Midland, studied the Swedish Health Care System through a study abroad program. While in Sweden, she made healthcare visits to primary care facilities, elderly care homes, hospitals, the government system, and Red Cross refugee care. She studied numerous topics that affect healthcare in Sweden and compared these issues to those affecting healthcare in the United States. This information will be incorporated into her Health Care Management courses this fall. Stephanie VonFintel, CPA, brings familiarity with Northwood and the Midland community to her new position as Assistant Professor of Accounting. As a student at Northwood, Stephanie (’03) interned in the finance departments at Arnold Center and the Midland Center for the Arts while pursuing her undergraduate degrees. She earned a Master of Science in Accountancy from Walsh College while working in the Midland office of Andrews, Hooper, Pavlik. After finishing her degree at Walsh College, Stephanie returned to the Finance Department at the Midland Center for the Arts as Assistant Controller and served as an adjunct faculty member in the Accounting Department at Northwood. Dennis R. Witherspoon, Finance department chair and associate professor, Midland, recently completed the study abroad component for his doctorate program of study in finance curriculum at Kansas State University. Dennis, along with six others, traveled to Beijing, China, for 10 days where he participated in practitioner discussions and presentations from Chinese MBA students. Dennis also presented his research titled “The Financial Domain of Life Satisfaction” to his cohort, Chinese MBA students, and faculty. While in Beijing Dennis also visited the Great Wall of China and the Forbidden City. Photo caption: Dealer Education Award 2017 honorees and Northwood students gather with President Pretty for the award ceremony. Front row L-R: George Sharpe, Jr. (representing George Sharpe, Sr.), Larry Mullinax, Eve Knudtsen, Russ Banks, Robert Ourisman, Mitch Walters (not pictured Ryan LaFontaine). Back row: NU President Keith Pretty and students Leann Colella, Charles Elledge, Norma Benavides, Kendra Taylor, Harry Collins, Shane Maurer, Nicholas Kret At the NADA convention and expo in January, Northwood honored seven automotive dealers from across the U.S. for their dedication to and support of education. Created in 1972 by Northwood’s cofounders, Arthur Turner and Gary Stauffer, the annual Dealer Education Award (DEA) recognizes dealers who serve their communities and the automotive industry by making noteworthy contributions to public and private education. The 2017 honorees included five Northwood alumni, the most to receive the award in a single year. Ryan LaFontaine, ’99, CEO, LaFontaine Cadillac Buick GMC, Highland, Mich.
Lawrence Mullinax, ’83, Owner, Mullinax Ford, New Smyrna Beach, Fla.
Robert Ourisman, Dealer Principal, Ourisman Automotive Group, Rockville, Md. George Sharpe, President, The Sharpe Collection, Grand Rapids, Mich.
Steven “Mitch” Walters, ’76, President & CEO, Friendship Enterprises, Bristol, Tenn.
Northwood recognizes the enormous contributions made by men and women to businesses, communities, nonprofit organizations, and public and private sector services. By acquainting our students with the lives and achievements of these present-day leaders, we provide an indispensable part of the education of America’s next generation of business leaders. 37th Annual Outstanding Business Leader Award “Northwood University has been honoring business leaders for their contributions to our nation and to the world for 37 years,” says Keith Pretty, Northwood University President and CEO. “By recognizing business leaders for their accomplishments in business, in their communities, and in their personal lives, Northwood encourages business excellence and inspires others, including our own students, to strive for success. 2017 Outstanding Business Leaders were honored at the March 4 dinner for their contributions to education, community involvement, personal and professional success, and dedication to Northwood’s philosophy. Proceeds from the event provide assistance to Northwood students with financial need and academic merit through the Outstanding Business Leaders Endowed Scholarship Fund. Northwood celebrated the outstanding accomplishments of seven women at the 2016 Distinguished Women event on Nov. 5. Honorees represent the values Northwood espouses to its students: commitment to free enterprise, partnership of arts and business, and management in a global society. “The creation of our Signature Events Team (SET) has allowed students at Northwood University to be actively involved and present at our signature events and ceremonies. The experiential learning opportunities that these students take part in range from onsite event execution to networking, meeting prep, and exposure to our honorees and friends of the University,” said Ashleigh Summers, Director of Signature Programs & Special Gifts. With the click of a button, Northwood University alumni gave fashion marketing students a boost in the job market. Project 100 awarded its inaugural grant for $10,000 to Northwood’s Fashion Marketing and Management Department to buy MockShop software. The grant will pay for 100 site licenses for up to three years, plus installation and training in this industry standard software. Project 100 is a novel way for graduates to direct their giving. Donors give $100 per semester; and the effort has 65 founding members who donate $600 each. Every donor is asked to vote for the project with the most merit. “There’s been a great buzz on campus, and all the19 project submissions were great ideas,” said Dan Waskevich (’11), an emcee for the presentations. Finalists make their pitches in front of a live and online audience, with Project 100 members watching. “Because of the online presentation and voting, my 3- and 5-year-old were also able to participate and help us decide as a family how we were going to vote for our donation.” said Project 100 member Michelle Mitchell. In her appeal for support, Davis-Bundrage explained how students currently create their designs. THE SIGNATURE EVENTS TEAM presented a proposal to enhance an outdoor recreational and gathering space on campus near Recognition Park. Features included seating, bonfire pits, picnic tables, tetherball, and outdoor lighting. THE MOCK TRIAL program appealed for tablets with student resources on them so students could better prepare for competition, two travel bags for mock trial equipment and a second camera system for each of the teams to use to study and improve their performances. The next Project 100 meeting will take place Saturday, Oct. 7, during the Northwood University International Auto Show. Excitement is building as work continues on North Village, Northwood’s first new student housing complex built in more than 30 years. The apartments are on track to open to 162 residents in August. The structure features 59 units — 24 four-bedroom apartments, 31 two-bedroom and four with one-bedroom. With the addition of North Village, the Midland campus will house about 900 students. The wood-sided exterior is no accident of design. Students in focus groups identified Northwood’s “woodsy, beautiful campus” as an important part of its identity. “I can’t wait to have this open so our students can experience it, because it’s going to be a game changer,” said Andy Cripe, dean of Student Affairs. There’s something special about writing a book. It is a permanent mark on the world. Two Northwood alumni have written books, and as they have learned, the process requires much more than simply putting pen to paper. Two decades into a successful career in the automotive and financial industries, Don Corder ('82) had what he calls "a burning bush experience." He decided to apply his skills to a higher purpose, helping religious and other nonprofit organizations handle their business and administration more effectively, freeing them to focus on their core missions. It has gone so well that Corder has made a thriving business of it, and now he's written a book, “Minding His Business,” to share some of what he's learned. "When a church needs a lawyer, it hires a lawyer," Corder explains in his book. "When a church needs a plumber, it hires a plumber. But when a church needs to conduct business, it often calls a butcher, a baker, a mechanic, and a stay-at-home mom to form a committee." Corder offers a better alternative: he provides professional business expertise combined with a commitment to the faith that is the foundation of the organization. His book offers a wealth of insight designed to liberate church and ministry leaders from the burden of the bottom line. "Chances are, if you work in a church, you are not an experienced businessperson, nor should you be," Corder writes. After several years of offering his expertise to a variety of churches and public service organizations, Corder launched a shared services organization called The Provisum Group in 2013. It grew quickly, and now has about 30 full-time employees and 25 as-needed employees offering a variety of business services to about 40 client organizations. As customers find out how liberating Provisum services can be, the word spreads quickly. Which is one reason Corder expects Provisum’s annual revenues to grow from about$1 million now to between $5 million and $10 million in five years. “There are 350,000 churches in America. This is a very, very significant niche." Many new parents tell their children stories, but Jaclyn Coy (‘05) brings a Northwood education to the nursery, which means she sees opportunity that others might not. “I think if you talk to people, a lot of them have a desire to write a book, especially a children’s book,” Coy said recently. Coy had a triple major in marketing, advertising and management at Northwood, then later earned a master’s degree in elementary education. She taught briefly before the career of her husband, Ben (’07), took them to California, where she has spent the past five years working for a marketing company. Their daughter Wynn was born in 2016, and it didn’t take long before the seeds of a children’s book took root in Coy’s mind. “The story basically wrote itself after my daughter was born,” Coy said. “It is a children’s book, but it’s definitely intended to entertain the parents who are reading it to their children. With her business expertise, Coy chose to self-publish the book, and even hired a freelance illustrator Love You to Pieces, Beautiful Monster from Romania to achieve just the look she had in mind. Coy has already completed a draft of a second book, but her long-term plans are to use the experience she has gained, coupled with her marketing background, to help other authors successfully navigate the self-publishing world. A brewery, a theater, a boutique hotel, an ice cream shop. The many business ventures of David E. Kepler and Kathleen M. Vertin make their hometowns stronger. Their example inspires Northwood University students, including those graduates who recently looked on as the pair received the University’s highest accolades. Kepler and Vertin were awarded honorary doctoral degrees as part of Northwood University's December commencement exercises. They joined Northwood’s Gallery of Distinction, reserved for 57 years of honorary doctorate holders, vested with the highest award the University bestows. Kepler and Vertin are strong supporters of the Northwood Idea, and Kepler delivered the commencement address before receiving his honor. Vertin has bachelor's and master's degrees from Northwood. Northwood’s standing as the premier university for automotive marketing turned out to be a very good thing for Jason Brickl, ’95, and Regina Brickl (Bombard), '95. Despite growing up in different states, they found each other, along with a shared business vision, at Northwood. Now married and living in Prairie du Sac, Wis., they use many of the lessons learned at the University every day in running several thriving dealerships in three states. Yet one of the most satisfying achievements for them is their philanthropic involvement in their communities and Northwood. Jason’s interest in automotive marketing was captured early on when he started working for Ballweg Chevrolet in Sauk City, Wis., at age 16. “Darlene Ballweg, the owner of the dealership, noticed me and became my mentor. When she learned that I wanted to own a dealership one day, she told me ‘Go to Northwood.’ So that’s what I did,” said Jason, who is now chairman and CEO of Ballweg Auto Family. After graduating in 1995, and spending time working in California, Jason rejoined Ballweg’s dealership in 1999 as general manager with a percentage of ownership. Since then, he and Regina have worked hard to build the Ballweg Auto Family business that now comprises five dealerships in Wisconsin, Minnesota, and Missouri. The Brickls’ success provides opportunities to make an economic and social difference in their communities. They actively invest in their town’s prosperity by supporting a variety of groups, including the local school district’s River Arts Center, Future Farmers of America, and Sauk Prairie Healthcare.Even their alma mater, where they met and learned the business of automotive marketing, is part of their commitment to community. Regina and Jason are thankful they developed their entrepreneurial drive, leadership skills, and commitment to social responsibility at Northwood. The Brickls’ belief in the University’s approach to education has grown even stronger over the years. They both appreciate that the University continues to improve and educate students who are bright and motivated. To share that confidence in Northwood, Jason takes time to recruit at the University and hire graduates. In fact, eight NU alumni currently work for Ballweg Auto Family businesses. The Brickls have also given their support in person and with contributions to the Northwood University International Auto Show and the Auto Show Gala. And for several years, they funded the Ballweg Automotive Group Annual Private Donor Scholarship. Their support continued in 2015 when they created the Regina and Jason Brickl Family Scholarship, which is offered to academically achieving students at Northwood. To date, three students have received the scholarship. “It’s rare to find greater commitment to the University than what you witness with Regina and Jason. They met as students, established a life together after graduation, built a successful business, and hired Northwood grads. And throughout all of that, they remain committed and generous donors. We are honored by their friendship and support,” said Justin Marshall, vice president of Advancement and Alumni Relations. To create a private donor scholarship, contact Sherri Riepma, private donor scholarship coordinator, at 989-837-4146 or email riepmas@northwood.edu. The list of Jack’s accomplishments, both professionally and as a friend of Northwood, is long and distinguished. Some of his Northwood highlights include helping establish the school’s bachelor’s degree in Automotive Aftermarket Management, becoming a member (the longest-serving in NU history) and chairman of the Northwood Board of Trustees, and co-chairing Northwood’s National Women’s Board and Friends with his wife. Equally important to Jack was supporting Northwood students in a more direct manner. In 2001, he and Marge established the John A. and Marjorie Hohman Endowed Scholarship to help students pursue degrees in the Entertainment, Sport, & Promotion Management (ESPM) curriculum. Jack leaves behind a university that is more robust and more dynamic because of his vision, loyalty, and dedication. 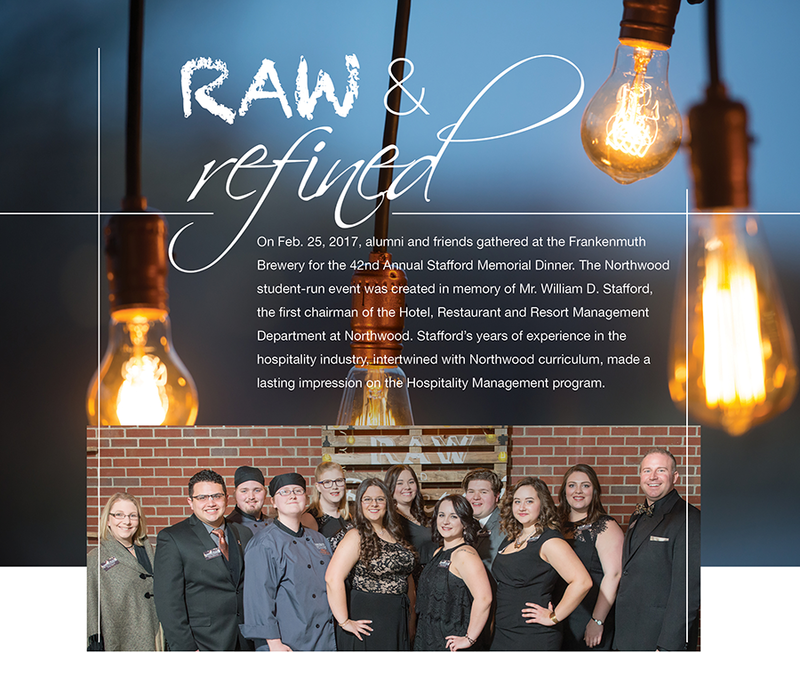 The "Raw & Refined" night of the 42nd annual Stafford Dinner provided Northwood University Hospitality Management students with real work experience as they combined raw industrialized elements and refined dining. Al Booney, a hospitality expert, spoke at the event, sharing his industry knowledge and ideas with Northwood students. Along with Booney’s presentation, guests were entertained by James Pagel Jazz Trio, Flare Bartending by Cory Fobar, and had the opportunity to take home goods from the silent auction and Treasure Box. The members of Team Vigilance, Houston Huff, Alec Bond, and Lucas Myhre, celebrate their victory in the second annual F&I Innovator of the Year competition, which challenges six teams of Northwood automotive students to conceptualize and build a new finance and insurance product. The team’s product, 401Karrs, addresses a concern among millennials and Generation Z: financial stability. With 401Karrs, this new generation of vehicle buyers will have a tool to help manage money by reducing or eliminating out-of-pocket expenses through a down payment on a vehicle. Dealers can also participate in reinsurance on the 401Karrs product, accruing interest on the money set aside for the down payment.